Australia played well for the majority of the game, but Carlos Restrep’s helter-skelter changes at 1-0 down helped his side draw level. Paul Okon opted for Jason Geria at right-back, meaning Josh Brillante moved into midfield, alongside the 16 year old Daniel de Silva, the youngest player at the tournament. Adam Taggart started upfront ahead of the top scorer in qualifying, Corey Gameiro. Colombia’s key player had been pinpointed as Juan Fernando Quintero, who started as the central attacker in a 4-2-3-1 formation. Cristian Palomeque and Andres Renteria flanked him on either side, all in support of the physically imposing striker, Jhon Cordoba. After an opening period in which both sides had a flurry of chances, Australia took control of the tempo of the game and should have scored more than one goal – but their slender lead instead allowed Colombia to get back in the game. An interesting feature was always going to be the format of the midfield. This is a team widely trumpeted as the first generation to emerge under the FFA’s new Curriculum, which mandates the 4-3-3 formation across all age groups. The personnel in Australia’s midfield suggested they’d be better suited to a 4-2-3-1, considering Brillante played the majority of the season as a double pivot for Newcastle Jets, while De Silva’s cameos for Perth have all come at the tip of a triangle. Early on, it became clear that Jackson Irvine was the deepest player, with Brillante playing to his right and De Silva higher up the pitch on the left hand side. When Australia pressed, this was even clearer, with Brillante moving up onto the same ‘line’ as De Silva. Australia’s formation was 4-3-3, 4-1-4-1, or even, despite the disgust of many, as the commentator described it, a 4-5-1. However, the notation of Australia’s formation was a secondary issue. Instead, the important feature was De Silva’s left sided positioning. He continuously drifted out into this pocket of space just to the right of Colombia’s Jose Leudo, collecting passes between the lines and looking to slide Taggart through on goal. The timing of Taggart’s runs was off, and he was flagged offside twice inside the opening twenty minutes, but Australia’s threat in those positions was palpable. Additionally, De Silva linked up well with the left winger, Connor Pain, who was more than willing to take on the right back, Helibelton Palacios, in one on one situations, and looked especially promising when he cut inside him towards goal. De Silva’s freedom in playmaking positions was linked to the pressing of Colombia. Within their 4-2-3-1, the attacking quartet moved high up the pitch and tried to close the Australian centre backs down quickly. Quintero moved forward and shut Good down, likewise with Cordoba on Chapman, and the threat was that Australia would be forced into long balls forward. However, they tried to play out from the back admirably, where Paul Izzo must be given credit for his intelligent distribution, opting to play short passes when they were available, otherwise clearing his lines when it was the safest option. Irvine dropped in between the two centre-backs – much like Sergio Busquets does for Barcelona, who are a key model of the FFA’s curriculum – and Izzo often found him with easy straight passes down the middle. As the Colombian midfield stayed deeper, forming a ‘back six’ with the defence, there was often lots of room for Irvine to turn on the ball and calmly play positive forward passes into the feet of De Silva. There was often acres of space between Colombia’s two ‘units’ and especially in the opening half an hour, Australia created lots of good chances, with Taggart’s link up play proving useful despite his frustrating offsides. Furthermore, with Colombia placing their wingers high up the pitch, there was often lots of space when the ball was turned over down the sides, so Australia tried to break quickly into these vacated areas. In particular, they often transitioned through Hoole’s right flank, with Pain having a shot cleared off the line from a quick break, and a dangerous low cross from Hoole. It was actually an interesting ‘division’ of attacks: the left side for longer periods of possession and build-up play, the right for quick counter-attacks. Eventually, at the very start of the second period, Australia scored thanks to a fantastic pass from Hoole to De Silva, after Brillante did well to play around Colombia’s press. The goal was a fitting reward for De Silva’s influence throughout the match. In contrast, Australia’s pressing felt more natural, more organised, as they sat off into a zone about fifteen yards in front of halfway in four ‘lines’ – Taggart by himself, then Pain, De Silva, Brillante and Hoole in the first bank of four. Behind them was Irvine in front of the back four. As this was a 4-3-3 v 4-2-3-1 clash, like we saw in Australia v Iraq, the midfield triangles were aligned perfectly, so Irvine tracked Quintero, while Australia’s two advanced midfielders picked up the Colombian double pivot. It meant when the Colombian centre-backs had the ball, there were no short passing options in front of them, and so they were forced into long balls towards Cordoba. 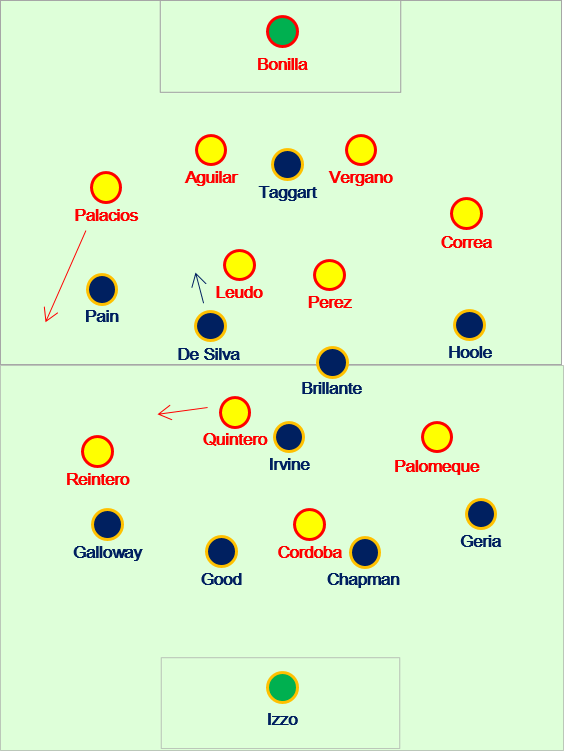 The difference for Australia in terms of playing out was that Quintero moved beyond his man, Irvine, to press alongside Cordoba, and Australia were patient enough to play past this initial pressure. On the other hand, Taggart had to press the Colombian central defenders by himself, but a difficult task was made easier by the fact that they couldn’t play the ball forward into midfield. However, this – the long balls – might have also been a deliberate strategy from Colombia, playing to the strengths of their physical no.9. Often, Cordoba placed himself up against Chapman, resulting in tight aerial battles between the two. Cordoba also received a few balls to feet, which drew Chapman out of the backline and forced Good to sweep up in behind. The individual battle between the two was fascinating. 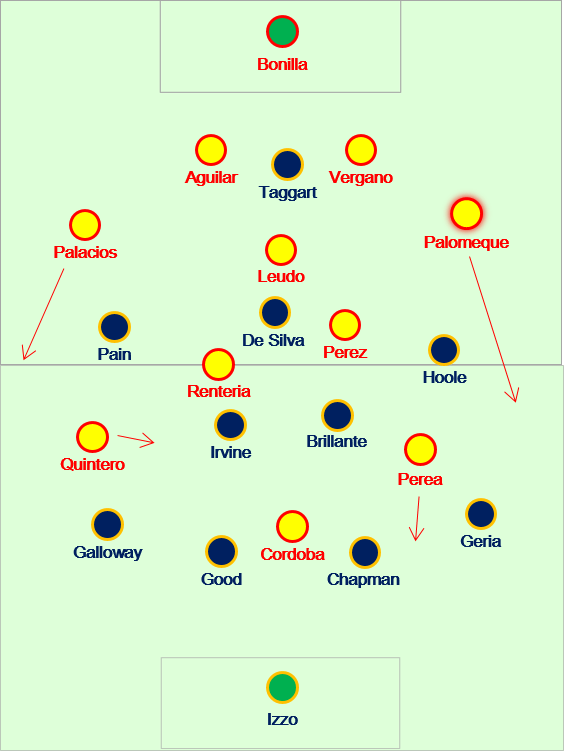 Meanwhile, Quintero’s movement was a bit similar to De Silva’s – he tried to escape the attention of Irvine by moving towards the right, at one point simply placing himself out on that wing next to Renteria, and trying to overload Galloway from the resulting attack. The majority of Colombia’s attacks came down the right, although their wingers swapped intermittently throughout. Geria and Galloway’s tactics were always consistent – trying to stay tight to their man and prevent them from turning and dribbling on the ball, which sometimes lead to cheap fouls. Quintero also looked dangerous when cutting inside onto his left foot, with a shot from the edge of the area flashing just wide, and later, he hit a magnificent through-ball for Palomeque from inside his own half. His quick feet also meant he won a succession of free-kicks, from which Colombia looked dangerous, with Paul Izzo forced into a fine save midway through the half. It was no surprise that their eventual equaliser late in the second half came when Quintero darted inside from the right channel and found Cordoba in the penalty box. Gradually, Colombia came back into the game, partly because they simply became more compact, with their coach gesturing with his hands frantically for his side to narrow the space between the lines – the defence pushed higher up the pitch, and Leudo began to follow De Silva into the channels, and overpowered him with sheer physicality. More importantly, however, Leudo also began to move high up the pitch to close down Irvine, with the front four still pushing up onto the defence, meaning Australia couldn’t play through their ‘free’ man in deep midfield. The by-effect of this was that there was more room for De Silva – but if Australia couldn’t work past the Colombian press, this wasn’t so much of a problem. As it were, they did so on two occasions, and on both occasions De Silva popped up in the box unmarked – he scored from the first opportunity, but scuffed his second chance. However, Restrep went into ‘panic’ mode, and began to throw on attackers as his side chased the game. At first, he was content to just push his full-backs extremely high up the pitch, and Andres Correa, the left back, came close with a sizzling volley – but not long after that, he was replaced by a striker, the pacy Brayan Perea. That meant Palomeque went to the left side of defence, and almost immediately, Hoole take advantage of his insecurity in that position, driving into the box for a fine shooting chance. Colombia were now playing something approaching a 4-3-3 – Quintero was permanently out on the right, with Renteria shifting into an advanced central midfield position. It wasn’t a particularly effective move though, as Colombia struggled for cohesion and seemed unsure of their positions – although they did see more of the ball through midfield, with Sebastian Perez hitting some nice passes forward. Restrep’s changes rather disrupted the flow of the second half, and although they scored through the Quintero-Cordoba combination, his side still felt oddly disjointed. It was significant, however, that Colombia had three players inside the box when Cordoba scored, which suggests there is something in simply throwing on extra attackers at the expense of attacking shape. In the second half, as they began to see less and less possession, Australia appeared a more dedicated 4-2-3-1, with De Silva sitting squarely in front of the pivot, and the wide players tracking back into disciplined positions on the flanks. It’s unclear whether the tilting of the midfield triangle was by design or by accident, but either way, the flexibility Australia showed was impressive. It had an effect on Australia’s transition play, as they counter-attacks didn’t feel as smooth – with Hoole looking especially tired on the right, and less able to get the better of his man in one-on-one battles. Okon made reasonable substitutions, especially the introduction of Ryan Williams, who replaced Pain but played on the right, with Hoole switching to the left. This was so the fresh legs could attack the defensively weak Palomeque, who certainly looked shaky when defending against Williams in one-on-one situations. Meanwhile, Corey Gameiro replaced Taggart with twenty minutes remaining, again a sensible move – the Fulham striker offered more of a physical presence and could hold up the ball, useful as Australia came under increasing Colombian pressure. The game became stretched after Cordoba’s goal, but neither side found a winner. Colombia didn’t play to the best of their ability but still created a number of chances, and Okon will be concerned about the freedom they conceded to Quintero in that pocket of space just to the right of the midfield. In fact, both playmakers thrived in similar areas – the key was that De Silva also burst forward and provided an extra goal threat. This was a technically assured performance for Australia, featuring good team organisation combined with outstanding individual creativity. “We knew what we had to do and we planned for it, and each of the players executed it to the best of their ability,” said Okon.